To tell you the truth, I'm a fickle fan of the 'purple genius.' His hits have always been creative and have been my main interest in his composing. So, breaking from my preconceived notions, I'm diving head-first into a pool of Prince album tracks to explore. The album opens with the epic album title track. "Planet Earth," builds from beautiful piano twinkling like a star in the sky to a groove about conservation, discrimination and peace on to a ripping guitar meteor shower. At nearly 6 minutes in length, it may be too long to be a single but you never know. The first single, "Guitar," is what you'd expect here. Pomp, strut and attitude with layers of P-Funk and possibly Eddie Van Halen after too many energy drinks. 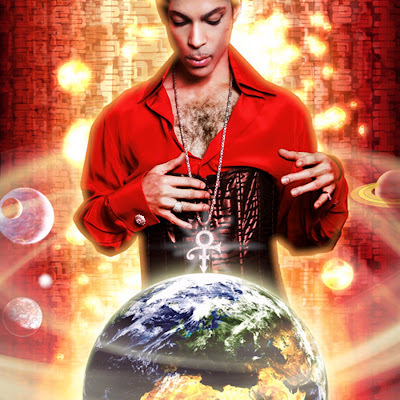 "Somewhere Here On Earth" is a planet away from the first songs as it is horn and piano driven with a soulful delivery. The energy steps up with the playful "The One U Wanna C." Pure seduction oozes "Future Baby Mama" which is one of the more surprising songs on the album. While, "Mr. Goodnight" features a lot of name-dropping, it gives him a chance to offer a near-rap vocal less syncopated than on his hit "Gett Off." Expected to be the second single, "Chelsea Rodgers" is meant for the dancefloor with big horns, extra female vocals and throbbing bass. I don't know what happened by the time "Lion Of Judah" and "Resolution" popped up but they aren't memorable moments. The water was amazingly warm and I found myself enjoying a majority of this album. If there is any criticism, it is that the end begs for the beginning as it is top heavy with strong tracks. I did have to deduct for having no album credits in this version (heck, the disc and the case didn't even list the song titles or track order.) But, Prince really shows his versatility as an artist here and Planet Earth is as diverse and possibly misunderstood as the third planet from the sun.